Photographs illustrating rare books in the National Medical Library. Philadelphia : [Surgeon-General's Office] 1876. Description, vol 1. :  p., [54 l.] pl. ; ill: 54 phots. ; 36cm. Description, vol 2. :  p., [50 l.] pl. ; ill: 50 phots. ; 36cm. Photographs : 104 albumens, mounted on printed cards. Photographer : Joseph Janvier Woodward, (1833-1884). Subject : Medicine & surgery — Canon. Author caption: John S. Billings, Assistant-Surgeon, United States Army. In charge of library. For biography, vide: Billings »». Reissued with 132 plates, Surgeon-General's Office, Washington, 1884. Photo captions: International Exposition, 1876. Captions include hand-written catalog numbers and credits to Woodward and the War Department. Index Medicus: 11410071300, 20502261210, 21302731200, 20502261340. Index Medicus (1884 edition): 11410081260, 20502261340, 21302731210. The photographs herewith submitted are intended to indicate some of the older and rarer books in the National Medical Library, and are to be placed in the International Exhibition of 1876, in connection with the Catalogues of the Library, as the safest and most convenient means of showing what has been accomplished in the attempt made by this Department to form a collection of medical literature which should meet the demands of the physicians of the United States. These photographs have been prepared under the supervision of Assistant-Surgeon J. J. Wood- ward, U. S. A., and are unusually successful. It must be remembered that many of these books are yellow with age, and that all yellow spots or stains appear in the photograph as dark or black spots. These photographs may be considered as being arranged in three series. The first series is taken from early printed books, the so-called "Incunabulæ," and from other works, which are rare, at least in this country. The second series relates to Surgery, and especially Military Surgery; and the third series is from rare books and pamphlets connected with American Medical History.—Preface. The United States National Library of Medicine began as a narrow bookcase in Surgeon-General Joseph Lovell's office and numbered only a few dozen titles at the time of his death in 1836. De minimis funding kept it small until 1862, when the collection was moved to the Riggs Bank Building in downtown Washington, along with a pathological collection that would become the Army Medical Museum. The library doubled to about 700 volumes through the efforts of Surgeon-General Hammond up to 1863, when Secretary Stanton thwarted Hammond's wish to establish a formal circulating medical library attached to an army medical school. The library comprised 2100 volumes and pamphlets by the time the first catalog was printed in 1864, and numbered 2,282 titles for the second catalog that was printed in 1865, many of these books selected by Woodward for his research. In December 1864, assistant-surgeon John Shaw Billings, a 27 year-old Lieutenant, was assigned to general administrative duties in the Surgeon-General office of Joseph K. Barnes, but by the end of 1865, Billings was working exclusively on managing the library. The young perspicacious bibliophile set out at once to organize and expand the collection aggressively, including the acquisition of incunabula and foreign titles brought back by touring American physicians. The following year, the library joined the new Army Medical Museum when it was installed in the reconfigured Ford Theater after the Lincoln assassination had rendered the structure unfit for staged entertainment. In 1887, museum and library, now called the Army Medical Library and numbering over 110,000 books and pamphlets, moved to separate departments in a grander facility designed by Billings and constructed on the Washington Mall. Until his retirement in 1895, Billings continued to build his visionary atheneum around the Surgeon-General Catalog which he transformed into the self-perpetuating Index-Medicus, a wonder of library science and culture that would evolve into the largest medical library in the world. Renamed the National Library of Medicine in 1962, the collection was moved to its present location on the campus of the National Institute of Health in Bethesda, Maryland. Today it is the repository of over 7 million books, journals, pamphlets, photographs, manuscripts, ephemera, sound recordings, films, and other archived materials. 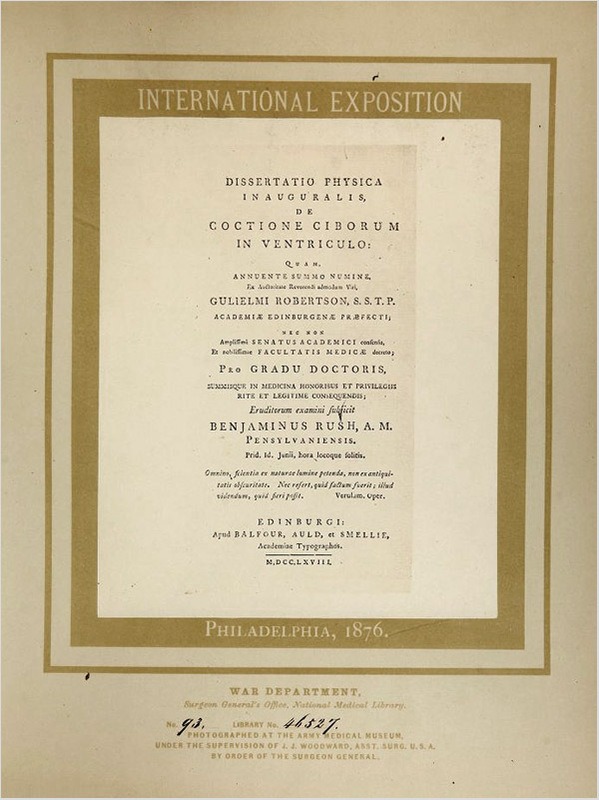 In preparation for the 1876 Centennial Exhibition at Philadelphia, John Shaw Billings asked Woodward to photograph the title pages of incunabula and rare books in the collection. A total of 104 albumens were mounted on decorative cards and displayed at the fair. The Surgeon-General Catalog indicates an 1884 edition supplemented with an additional 28 plates and exhibited that year at the New Orleans Exposition. Either the extra plates were printed by another photographer, or they were printed by Woodward at a much earlier date, because poor health forced his retirement from the Army Medical Museum on February 11, 1881. He suffered from a nervous exhaustion that was followed by a pleurisy intercurrent to breaking his leg from a spill his horse took on the icy pavements of Washington, January 1, 1881, a day of historic low temperatures recorded as "New Years Deep Freeze." Woodward died at Dr. Livingston's private hospital for brain diseases in Wawa, Pennsylvania, on August 18, 1884, a few months short of the opening of the New Orleans exposition. During his tenure, Woodward was author of many of the circulars and reports issued by the Surgeon-General's office, and in collaboration with his colleague, George Alexander Otis, he produced the massive six volume, "Medical and Surgical History of the War of the Rebellion." In honor of the fact that Barnes, Woodward, and Otis were all graduates of the University of Pennsylvania Medical School, the plate represented here is the title page to Benjamin Rush's doctoral thesis. Rush represented Philadelphia at the Continental Congress and was a signer of the Declaration of Independence. He was Surgeon-General to the middle department of the Continental Army in 1776 and laid the foundation for U. S. military hygiene with his pamphlet, "Directions for preserving the health of soldiers." He was the first American professor of chemistry at the College of Philadelphia which evolved into Pennsylvania Medical School and he wrote the first American textbook in chemistry. • The two 1876 volumes can be found online at the U. S. National Library of Medicine, Digital Collections (vide: NLM »»). • Miles, Wyndham D. (1982), "A History of The National Library of Medicine: The Nation's Treasury of Medical Knowledge." Bethesda: National Library of Medicine ; NIH Publication No. 82-1904. »»). • Lamb, Daniel Smith (1843-1929), "A history of the United States Army Medical Museum, 1862-1917." Unpublished manuscript archived at the National Library of Medicine (vide: Lamb »»). 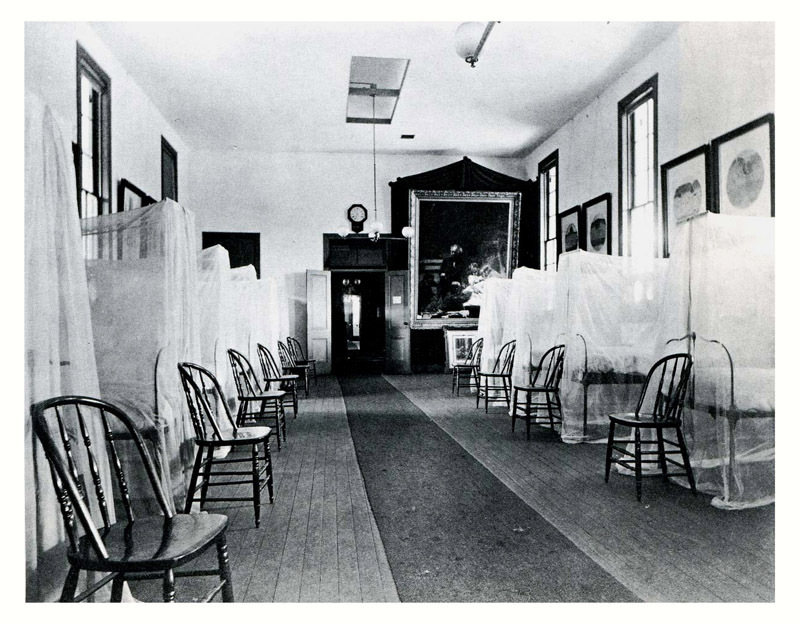 • Interior view of "Room 1," hospital wing, (vide: »») in the Army Medical Pavilion at the Philadelphia International Exhibition. Note the large format prints (24-inch diameter) of Woodward's photomicrographs hanging on the wall, representing ulceration or inflammation of the colon wall—possibly illustrations from the medical volumes of MSHWR. In the background is Eakins's painting, "The Gross Clinic." Photograph was commissioned by Eakins and is archived at the Library of Congress. • For a complete description and inventory of the rooms in the Army Medical pavilion, see the Congressional Edition, Volume 2119 (Washington, U.S. Government Printing Office, 1884 »»).